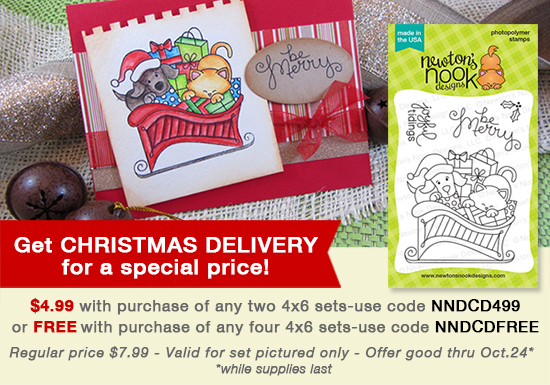 Newton's Nook Designs: Two Kitty Christmas Cards on Kraft! I LOVE kraft paper - and Christmas Kitties!! Today I'm sharing two cute kitty cards using our brand new Newton's Curious Christmas Stamp set. I'm having SO MUCH FUN with this new set - the images are so fun to color! For these two cards I stamped the images onto Kraft card stock and colored them with colored pencils! I'm just loving how this looks. I especially like how you can add white coloring to really make it pop - like I did on the snowman card - and then I stamped some snowflakes with white ink too. Holiday Release Available + Sale until Friday! If you haven't had a chance to check out our Holiday Release yet - make sure you pop over to our Newton's Nook Designs online shop to see what's new - Plus, we're offering our new Christmas Delivery mini set for a special price until Friday, Oct 24. (while supplies last - they're going fast!). Such fun cards! I love them both!! Gorgeous! Newton makes me so happy! So cute! Love the stamped images on Kraft cardstock! These are just too cute! Loving these new sets!